Among traders, the magazine cover indicator is legendary. The indicator holds that when a major market story hits the covers of popular publications, the trend is about to reverse. 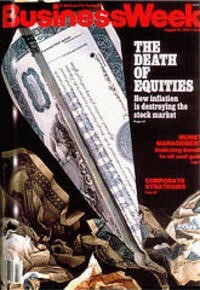 The most popular example is Business Week’s August 1979 cover story, The Death of Equities. “Whatever caused it, the institutionalization of inflation—along with structural changes in communications and psychology—have killed the U.S. equity market for millions of investors. “We are all thinking shorter term than our fathers and our grandfathers,” says Manuel Alvarez de Toledo, of Shearson Loeb Rhoades Inc.’s Hong Kong office. That article came more than 13 years after the stock market peaked in 1966. But it wasn’t really time for the death of equities. It was actually time to buy. The arrow in the chart below shows the timing of the magazine cover. The bull market that began shortly after that ended in 2000. Last month, the yield curve inverted, and the story was widely covered. “Alarm bells rang for many investors when the U.S. Treasury yield curve recently inverted for the first time in roughly a decade. Yield-curve inversions are rare occurrences in which short-term interest rates exceed longer-term rates. For several decades, these events have served as reliable predictors of a coming U.S. recession. The logic behind this link is that bond yields can be thought of as a proxy for growth expectations. So if the market is looking for less economic growth down the road (10-year bond) relative to today (3-month bill), that is a forecast for a weakening economy — precisely the sort of environment that can culminate in recession. Even though forecasts of “less growth” should not imply “no growth,” deteriorating expectations often build upon themselves, creating a vicious circle into recession. The yield curve has merely inverted by a handful of basis points thus far. This fact doesn’t invalidate the signal altogether, but it means the signal is at the faint end of the spectrum and could well vanish with only a slight recalibration of the bond market. Most econometric models of the yield curve require that the curve be inverted for a full quarter before formally triggering a recession signal. That has not yet happened, and there is a chance that it doesn’t happen at all given the limited extent of the inversion. On average, a recession occurs about a year after the yield curve inverts. Granted, the historical experience has varied, from a short lead time of just half a year to a long lead time of nearly two years. But the point, in all cases, is that an inverted yield curve doesn’t predict a recession tomorrow so much as it predicts one in about a year’s time. That leaves a bit of breathing room. Normally, the yield curve is upward-sloping not just because of expectations for improving growth and rising policy rates but because longer-term bonds naturally command a term premium that sits atop this. However, for reasons related to the legacy of quantitative easing and distortions arising from liability-driven pension funds, the term premium no longer exists today. This is key because in the past, an inverted yield curve didn’t just mean that the market was pricing in a slightly worse economic environment in the future. Instead, it meant the market was pricing in a much worse economic environment, as the term premium kept the longer end elevated until the outlook was truly dire. Today, without a term premium, one could argue that the yield curve needs to invert more significantly than normal to furnish the same signal. This is important, though let us equally acknowledge that there is an alternate specification of the yield curve that doesn’t rely on the term premium, and it has also inverted. Suffice it to say that the water is muddier than usual. The inverted yield curve is undeniably bad news, but it is not exactly a shock given its slow-motion arrival. RBC Global Asset Management has argued for some time that the probability of a U.S. recession is about 35 percent for 2019 and 40 percent for 2020. This was once considered pessimistic, but is now interpreted as on-consensus or even optimistic relative to some market views and the output of formal recession models. The magazine cover indicator tells us that popular publications are often wrong. This indicates it could be best to heed the warning of the yield curve. It is possible the curve may not signal a recession or a beat market in stocks. But that is basically assuming that this time is different. The yield curve did invert before recessions in the past and there were false signals. But most were timely warnings of economic slowdowns. In this environment, it could be best to prepare for the worst and be pleasantly surprised by potential gains. If the market does rally and the economy does expand, the result might be below average gains. Failing to prepare for the worst could lead to catastrophic losses since stocks did fall more than 40% after each of the previous two inversions.